I have been terrified of the toerail job more than any other job on this boat, and have been dragging my feet on the project for about ten months now. I'll explain why. It had to do with the cosmetic standards of toerails that are "good" versus "good-enough". Good toerails have even edges, carefully curving lines, and smooth splices, yet that needs to be achieved through the thugish, messy job of rapid deck drilling through curing caulk while long lengths of lumber are brutishly bent into shape, and the two just don't seem like they will make placid partners. But nearly a year later, we've managed a more-than-satisfactory finish (almost), and I'll tell you how. Well, Sarah and I have been brainstorming this problem for a while. We figured that before we could start we would need the materials and a good idea of what standards we would need to meet for engineering requirements of securing the hull-to-deck joint. 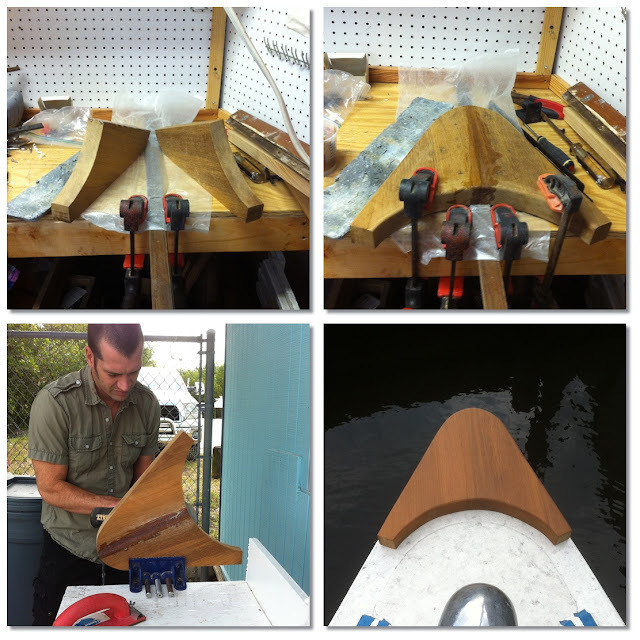 Our original toerails were made of (likely) Burmese teak, about 1 1/2" wide X 3" tall and had a curve and outward sweep to match the hull. We removed them months ago on the hard in The Point of No Return We decided that they were far higher than they needed to be, and we wanted something more reasonable, replaceable, and repairable, so we decided on a simple 1 1/2" square with rounded edges. We left the aft portion of the rails behind the turning blocks because it was still in salvageable shape. That meant we only need to lay new toerail on 30 feet per side, so we bought 70 feet (six 9' sections and two 8'), figuring the ten feet would be plenty of extra, and we are glad we did! We bought the teak lumber from a guy in the Florida keys. He had teak for prices so incredible that we could afford the shipping on 9 foot sections and still save money over buying it from anyone else... This is a mistake. If you want good lumber, I would always recommend that you go somewhere you can place your hands on the board before you buy it. Exotics and nicer Hardwoods are sold by actual dimensions and not finished lumber dimensions, where a 2x4 is actually 1 1/2 x 3 1/4. I know that people like to fudge this line, and I know that big milling saws leave poor cut edges that must be finished to a slightly smaller dimension, but the boards were 1 7/16" x 1 3/8, with noticeable saw marks on all sides, but apparently "the milling process will leave a surface that may need to be planed down to less than 1 1/2", additionally one of the 9' sections had a massive hollow that "is a naturally occurring void pattern in teak and could not be guaranteed to not 'appear' in your lumber" ... that phone call did not end well. To top it all off, the wood has relatively little color variation in the widely-spaced growth rings with a much paler tone than teak should be. Definitely the lower grade products of a fast-growth Caribbean teak plantation. We should have bought our toerail material from Mark at MR Woods; he's got the nicest teak, and he lets me hand-select all my boards and then rips them slightly oversize. Turns out this is the only picture I have. They are wet with teak cleaner in this photo, so they aren't quite showing their blondness, But a couple of the dry ends show how light they are. 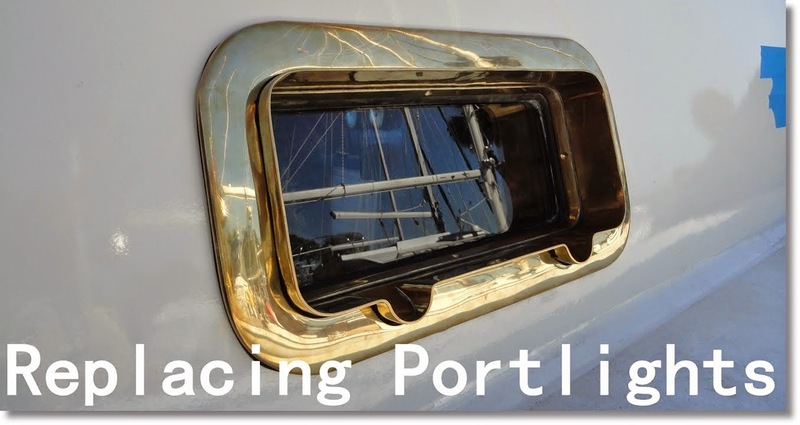 For structural requirements we turned to our engineering friend (also) Mark, who has Lloyd's of London yacht scantlings requirements in easy reference. 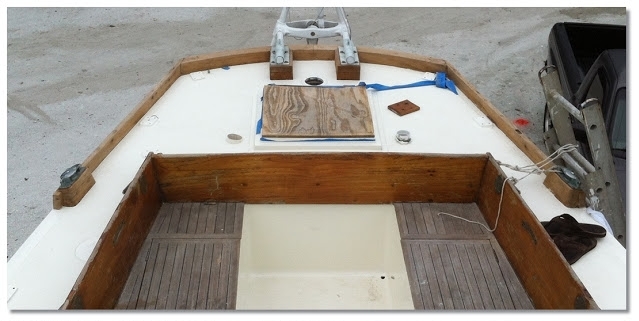 Based on Lloyds of London scantlings, our optimum option for joining the deck-to-hull inward-flange seam was with 1/4" bolts on 6 inch centers. The old rails were held down with larger 3/8" bolts but spread across ~9 inch centers. Current Lloyds standards show the original method to be weaker than our needed specifications, so we bought piles of 2 1/2" long 1/4" stainless bolts and enough nuts and washers to serve. With the basic engineering and material requirements fulfilled, it was time to brainstorm just how to do the damn things. This is where the procrastination really began... about nine months ago...There are a lot of things to consider though! Splicing for instance requires a good bit of time and some tooling to complete satisfactorily. 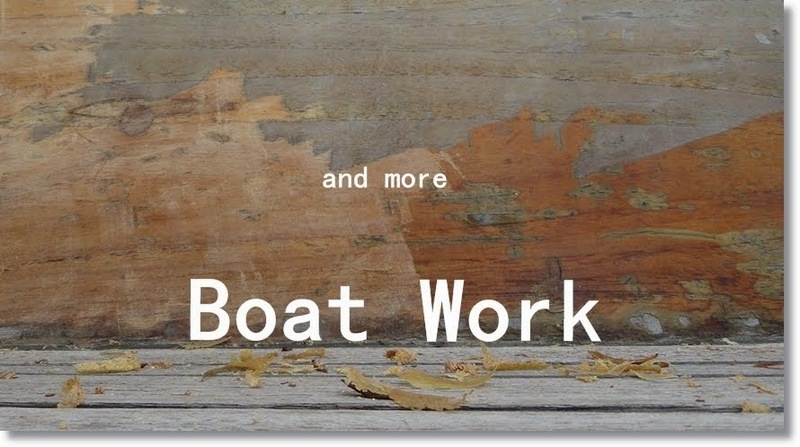 I first learned about splicing boards into longer lengths from my father about 20 years ago when we made the gunwales on his 14 foot sharpie skiff "Shoestring". Dad first built a simple angle jig and used a power planer to cut the ends of the board at an 8:1 slope tapering to wafer edges. We then set the long faces against each other with glue and clamps. 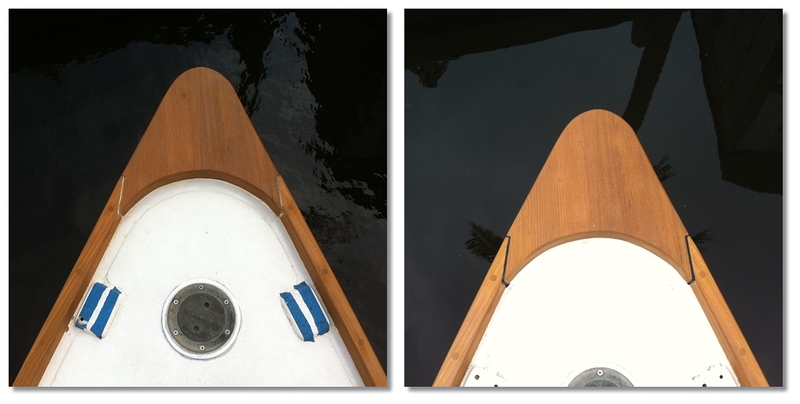 This results in the strongest splice, but if the slope is too steep, or the wood too translucent, or the fit less than impeccable, then the glue line can show through the thin tips. During our hunt for solutions, I also saw a local woodworker doing a toerail repair on a boat next to us in the yard. He did his splices with a vibrating multi-tool with a plunge blade that he carefully plunged across the top of a wedge-shaped pattern made from a piece of plywood clamped to the rail. I was impressed by the ingenuity, and his trained eye and steady hand resulted in a fine fit, but with the same glue bleed-through wafer edge described above. 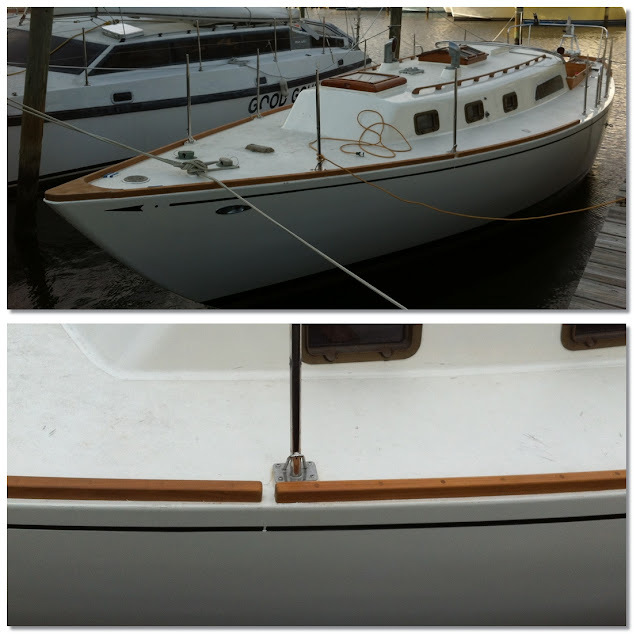 Finally, I looked at some well-kept deep-keel cruising boats of SV Robin's vintage with square toerails, and they frequently have no splices at all. Each rail section just has blunt ends, leaving a 2" water-shedding gap, simultaneously eliminating both the splice and the need for the easily-clogged drain cutouts under continuously spliced rails. Now here was a method I could get behind! It justifies the easy-labor way of a lose-lose aesthetic compromise with the excuse of Bauhaus-styled practicality! My Teutonic soul rejoice! Finally, we had to figure out the logistics of how to actually bend, drill, and then mount the rails without smearing caulk everywhere-but-where-you-want-it as the curing clock is ticking. Everyone I've talked to said : Dry fit the rail. Tape everything. Caulk everything, ... and then just do your best to bend the rail up high enough as you are bending it inwards, and try to not smear all the caulk off as you are pulling it into position, which you will, while bedding each bolt along the way. Just plan on using lots of mineral spirits and rags to clean up afterwards. Overall messiness aside, this method requires a caulk that doesn't cure for quite some time as you do your best to get the rail on before it all starts turning lumpy or getting a skin. Those sorts of caulks tend to be far messier than our favorite caulking product: 3M's 4000 UV, which, unfortunately, only comes in a "fast cure" variety with a 15-30 minute working time. However, if you have used the stuff, then you know it pulls the smoothest beads and the cleanest lines every time due to the perfect high-viscosity-yet-not-too-sticky factor, resulting in a high finish-to-fussiness ratio. (Purely scientific stuff here). 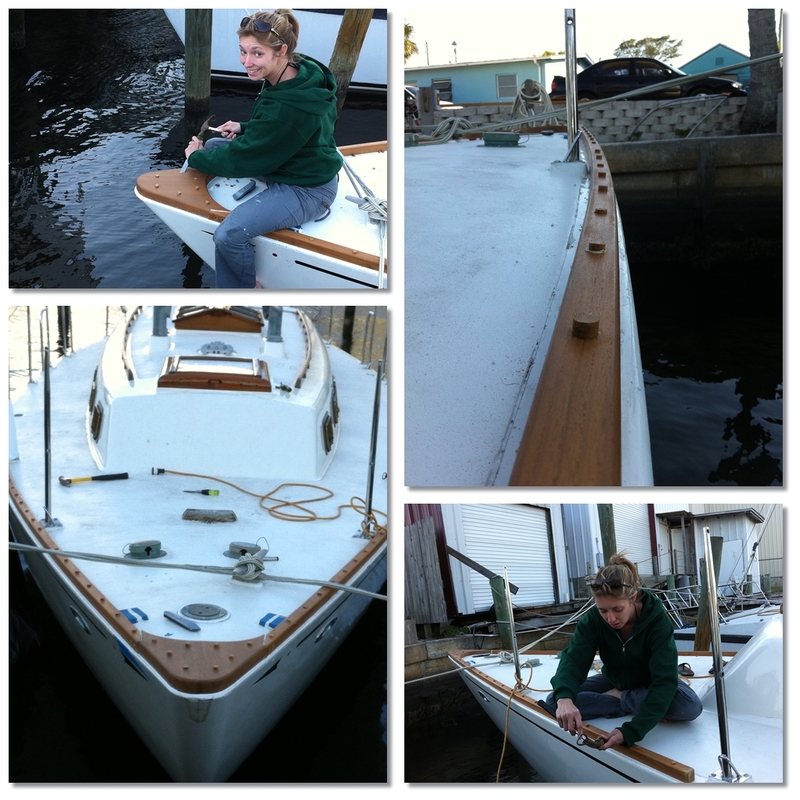 Sarah's solution: Dry fit the rail. 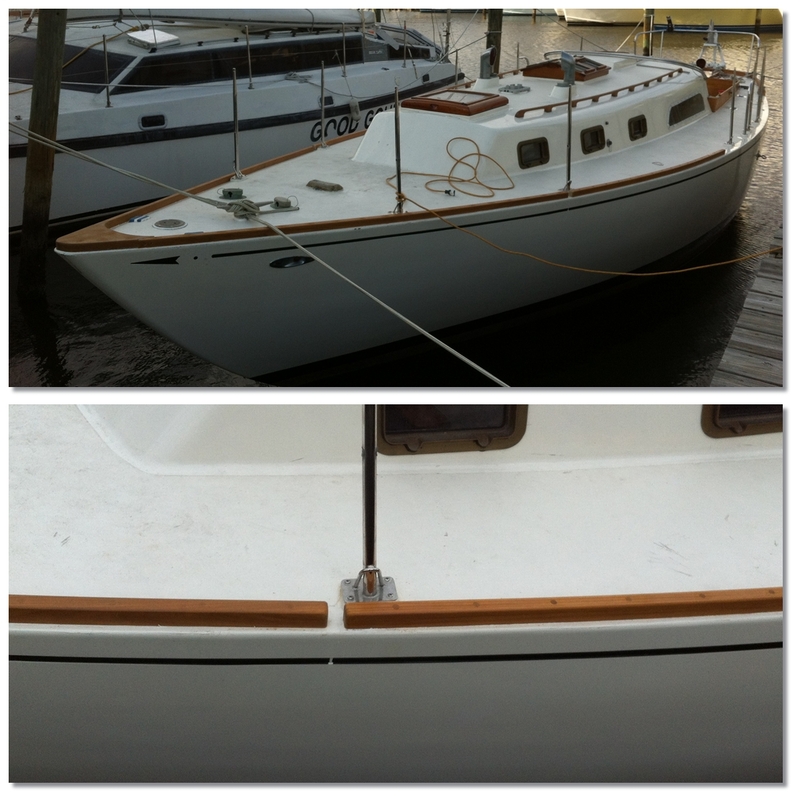 Use our inch-too-long bolts to allow us to keep the rail bent and aligned while we lift it off the deck. Then just squeeze a long bead of caulk underneath the lifted rail and hammer the whole thing down flat in a matter of seconds! We could then go back and pull each bolt one at a time and bed them with an extra dab of 4000 UV before we screwed them tight. 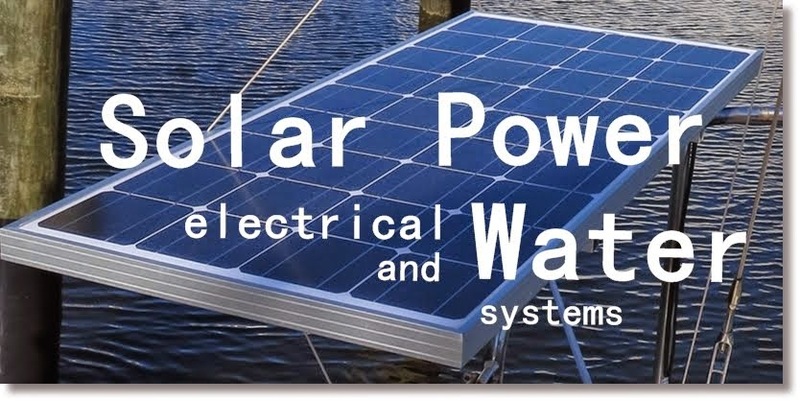 But for the months of planning, no one we talked to, either online or locally, recommended 4000 UV. It was always a battle between 3M's 5200 and BoatLIFE's Life-Caulk, with a couple votes for Life-Seal or 4200. The ages of humidity and heating/cooling cycles through the rainy season and the winter had warped most of the lumber. Luckily for toerails this is a good thing. I recently pretended it was intentional, allowing us to hand pick the best warp in the individual boards for our purpose. We had the stem plank blank halves cut out "just" last month, and I joined them at a slight angle to match the crown of the deck and and shaped the complete piece with hand tools over the course of that month. 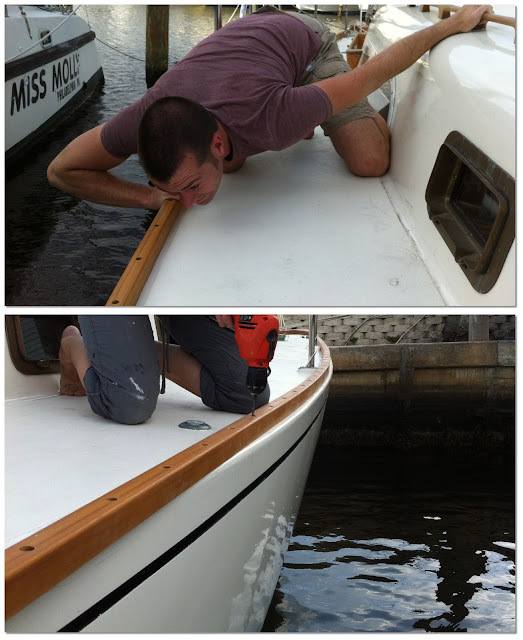 Then just days before we were going to lay the rails, I went out to buy a few tubes of LifeCaulk, and I ran into yet another experienced boatyard worker. 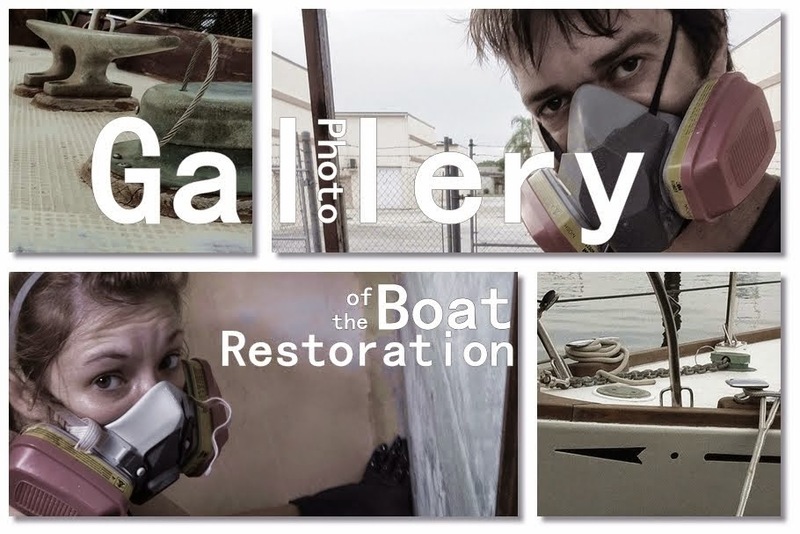 He had done 15 years with the Hinckley yachts woodshop before working another 10 years as the foreman of the wood shop at Scopinich yachts. I asked about toerails, and he said that they had to do "hundreds" of them after the last hurricane. He immediately recommended 4000 UV for all the reasons I already mentioned above, and assured me that the working time would be sufficient for the task. Since we know that we all search the world for opinions that agree with our own, this man immediately became all the expert recommendation/agreement that I needed. Also, according to my now-favorite local in the industry, 4000 UV's anti-mildew components allow it to outlast 5200 in non-underwater applications where sunshine and mildew are more likely sources of failure than pure internal strength. Even more music to my biased ears. So I described Sarah's solution to him and he paused for a moment before saying "That's a damn good idea. I've never heard of anyone doing that. Then you don't have to worry about working time and smearing it around"
Yep. I commend you for your continued agreement with my opinions. So with our newly-acquired confidence in our plan, we bought four 10 oz. 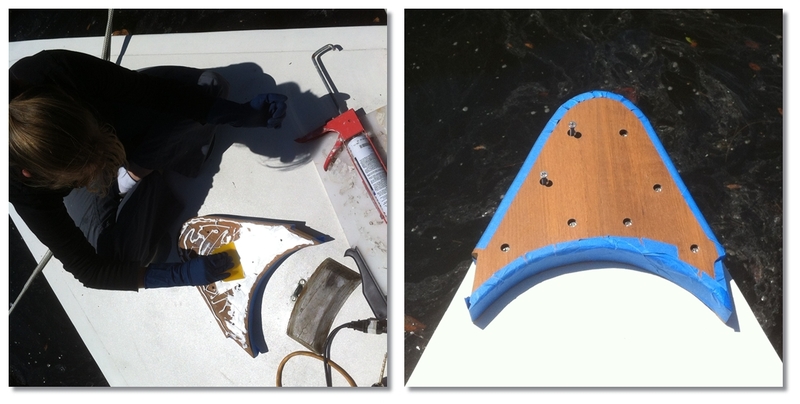 tubes of 4000 UV, and ran to the boat to begin pre-drilling the rails and stemplank with a bit and clamp on countersink set to the correct depth on our handy drill press. Then I was considering attempting a vertical version of the yachtie-like "Z" splice on our stem plank to toerail joint, but before I started, I realized that the pre-assembly prerequisite of the four parts would result in a piece so large and three dimension-ally complex it would render the project highly impractical, and would likely cause the joint to fail miserably regardless of gap quality. So I found another practicality-based solution that appealed to my sense of taste without losing the wooden-yacht feel : a "Z" shaped black polysulfide seam. 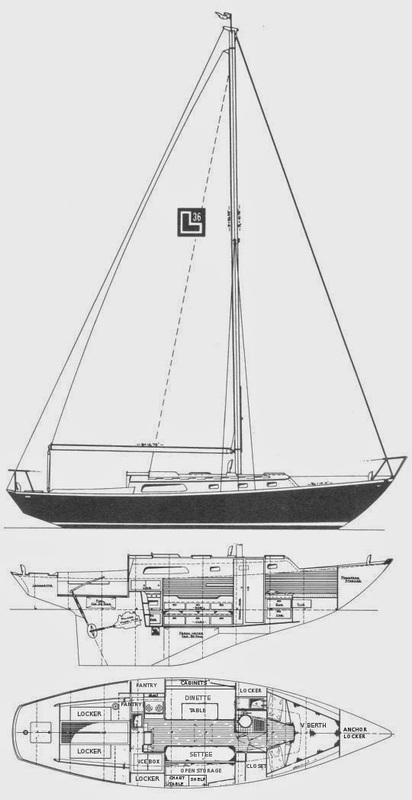 It is flexible, and it is forgiving of the inevitable gap that will be created by the complex three dimensional splice as the toerail bends around the heavily crowned deck at the stem. So I cut the ends of the first two toerails, cut the matching pattern into the stemplank, and we drilled, glued, and screwed it onto the boat. We began dryfitting the rail by cleaning every surface with an acetone soaked rag. Once it was all clean and dry, we drilled and secured the first two bolts and used them as the bending point to "coax" the wood into position. We drilled holes through the deck using the pre-bored holes in the wood as guides and dropping/hammering a bolt through each hole before moving on. Then I went back and carefully pried the toerail up at each bolt, and sure enough, the bolts were plenty long and strong to hold the rail in place a healthy inch or so above the deck. So we just cleaned the area of drilling debris, taped the rail, laid a fat bead of 4000 UV, and pounded the rail home within a couple minutes. Then Sarah went back and bedded each bolt individually. 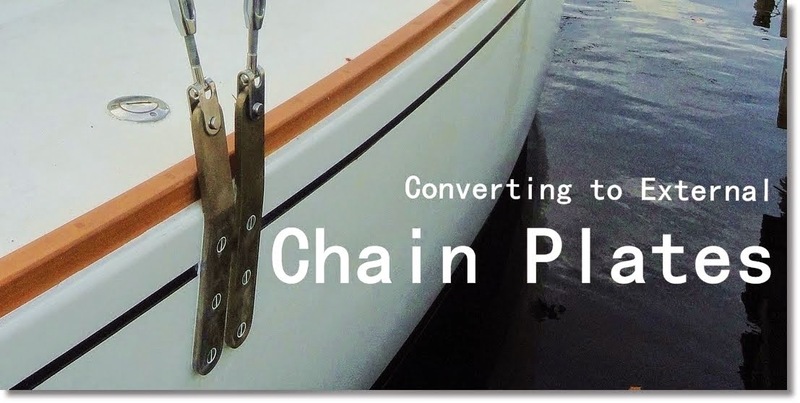 She screwed them tight as I assembled and held the nuts and washers on the inside of the anchor locker... That sort of contorted, muted yelling match to establish synchronization is an exercise that can test marriages. We recommend sharing statements of mutual understanding and a few hugs beforehand so that you can finish the task and still have lunch together afterwards. The whole process took about 20 minutes, and the caulk was just starting to skin over and "curdle" when we had finished tightening the last bolt on each section. I deep sigh, a high five, and sopes de carnitas at our favorite local Mexican place, El Mariachi. We probably should have taped the deck as well, but we decided since it was already not going to pull a nice line without a lot of solvent that may weaken the bond, we decided to try and let it cure overnight and cut it back the next day. It worked out quite well, and the next morning Sarah cleaned it up to a fine line with just a scraper. Then I gave Sarah a brief and inexpert tutorial on how to bung the countersunk holes and left her to do all the plugs while I wrote the last post on our bulkhead replacement. She showed me how she had already mastered the craft, making the next 76 plugs look like they were smeared in with wood-grain-Photoshop-ed butter. 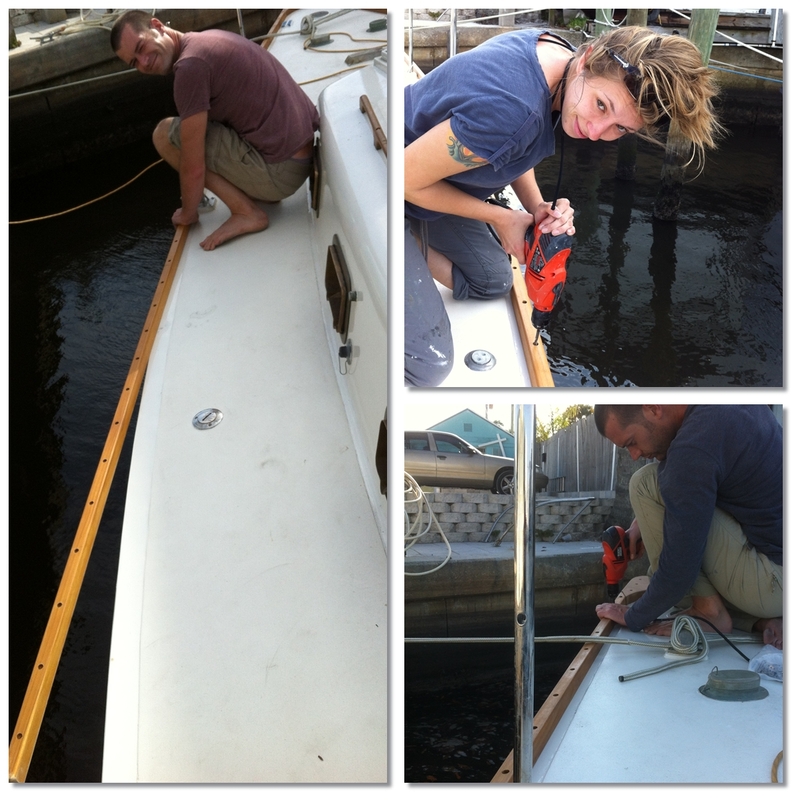 I then added black polysulfide to the gap-splice of the stemplank and we let it all dry overnight. 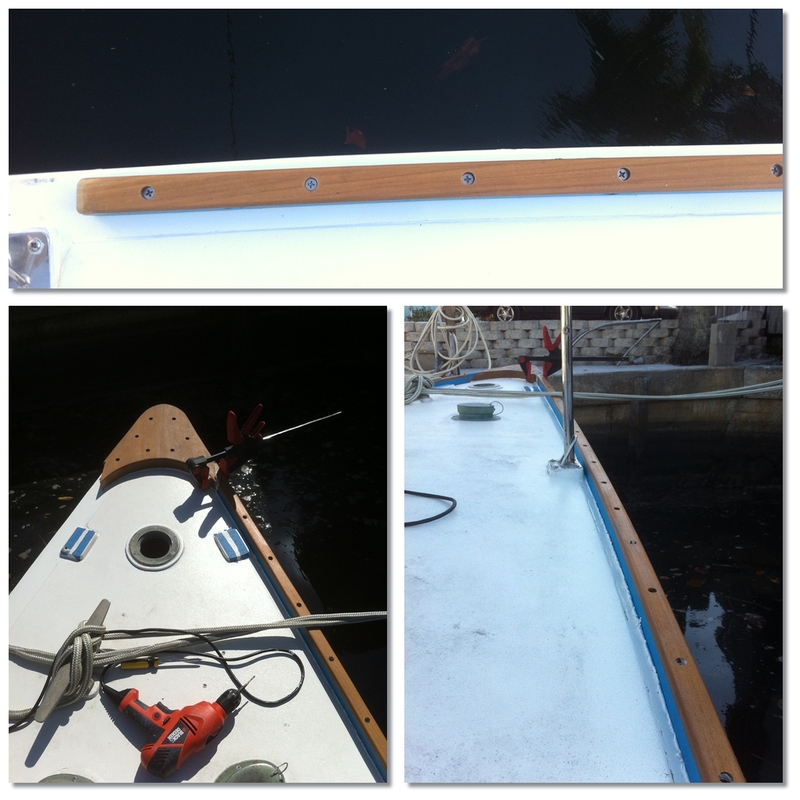 The next morning a fresh touch up with teak oil sealer on the dry wood and plugs, and the results were impressive. By the end of it, I couldn't believe how easy it was. I couldn't believe how scared I was a year ago. We still have a couple sections left, but they will have the genoa tracks on the top, and we haven't gotten the aluminum track sections yet. you guys are almost there! Very nice addition! Good job. Rik, I saw that you are building a Welsford Pathfinder! I love Welsford's designs. I have plans for Rogue and Penguin in my collection, and I dream of building a pathfinder one day. Looks amazing! That's mighty impressive, guys. Still loving the blog. I'm undertaking the same project (ugh!). I've been looking carefully at your pictures, and am I incorrect in believing that your hull-deck joint is glassed-over? If so, did you guys do that, or was it done previously? The hull to deck joint is not glassed over. On the inside there is a layer of glass tape on the joint from the factory, but it is not structural, it is just to prevent water intrusion. When we removed the toerails, we epoxied all of the old holes shut so we could drill a new series of holes, but there is no glass over the external joint, mainly because through bolting is a structural necessity. If you want to strictly have a glassed hull to deck joint, then a LOT of work must go into it to make it structural such as feathering the new glass work a good foot and a half or more down the side of the hull. Our bolt size and spacing measurements were taken from Lloyds of London scantlings requirements for a boat our size/displacement and shape.